Before it got too cold and all the flowers go into hibernation, I wanted to share a few of my favorites from our first summer at the house. The hibiscus is probably my favorite flower. I had no idea there were so many different kinds. 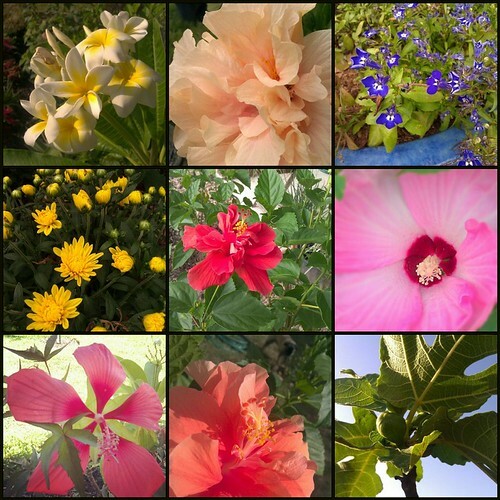 We picked up double blooms in a variety of colors, the pink luna with its large dinner plate size flowers, and a scarlet swamp hibiscus with five huge red petals. They only last about a day after blooming but there are always more to take their place. Since fall is here, I added a variety of mums to the front garden. My family has always had them in our flower beds and I love how they bloom just as everything else is slowing down. I also added containers with knockout roses and put in these tiny blue flowers around the base. My most anticipated plants this year, though, are fig trees. We picked up a black mission and a brown turkey. I've read that people have their preferences - all I know is: I love figs! !